How Do I Keep My All-White Place Looking Clean? A little dedication (and a few smart hacks!) is all you need. 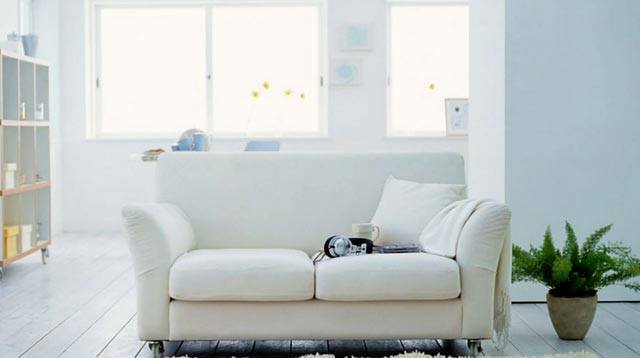 Whether you already have an all-white apartment or you're currently styling your space to have a colorless aesthetic, you probably have one very important question in mind: How do I keep my white home white? 1. Protect big ticket furniture with slipcovers. Although white pieces of furniture add elegance to a room, it is avoided by a lot of people for an obvious reason—it's prone to staining. To avoid this, make sure to protect it from dirt and spills by adding a slipcover. It comes in a ton of colors and textures so you're guaranteed to find one that fits your aesthetic. 2. Treat fabric items with stain guard. If you don't to deal with the maintenance of having a slipcover, splurge on a stain guard. This canned spray (3M Scotch Guard Fabric/Upholstery Protector is a good one!) will shield your belongings from spills–you can just quickly wipe them off before they turn into stains. 3. Invest in professional cleaning. While maintaining your home by yourself is great, there are some things that are better left in the hands of professionals. Try setting an appointment with professional cleaners once every two months—this is required to keep white pieces as clean as they can be without risks of ruining the items. 4. Don't wash white linens and pillowcases with colored items. Keep all fabric items looking pristine by washing them in detergent with warm water, but skip the bleach. Strong ingredients break down the fibers and cause discoloration. If you have to deal with stubborn stains, try oxygen bleach as an alternative. It may not be noticeable at first glance, but walls can be taken over by grime, too. To keep your white walls from turning gray over time, make sure to deep clean it once in a while. Wash your walls using three to four drops of liquid detergent and a half-filled bucket of water. You can also add in 1/4 cup of white vinegar for a stronger solution.